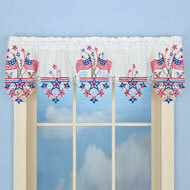 Darcy Two-Tone Window Valance from Collections Etc. 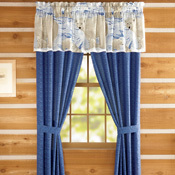 The classic style of this beautiful curtain is a perfect addition to your traditional decor. 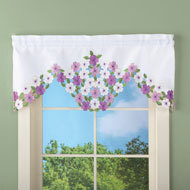 This double layered valance is available in 5 colors. Rod pocket top for easy hanging. Machine wash. Polyester; imported. Colors available in Burgundy, Beige, Grey, Black, Green, or Navy. 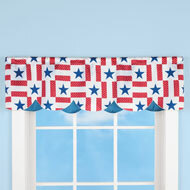 Valance measures 14"L x 58"W.
These are great and the colors are perfect. I did buy this product again. Love it! I was so pleased with the Darcy Valance! I recently updated our bathroom and changed the color scheme to include lt. and dark gray. The gray valance matches the new dove gray vanity, light globes, and shower curtain. I love it! - Joanie K., Dade City, Fl. kitchen. they look very nice on my windows - Sharon, Minn.